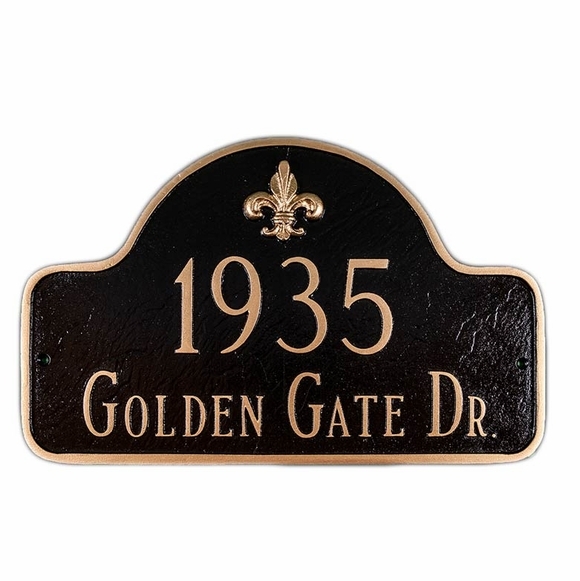 Personalized 24 x 15 Fleur de Lis Arch Plaque - - estate size address plaque embellished with a fleur de lis in the arch. Order as a one line or two line plaque. Made in USA. Two lines with up to five 4" numbers on line 1 and up to 17 characters on optional line 2. If you are ordering a sign with one line only, please leave the Line 2 input box blank. Twenty-six different color schemes. Available in these colors: antique copper copper, aged bronze gold, black copper, black gold, brick red gold, brick red silver, black silver, black white, chocolate gold, chocolate silver, gray silver, gray white, hunter green gold, hunter green silver, navy gold, navy silver, sky blue gold, sky blue silver, sand gold, swedish iron black, swedish iron silver, sand silver, taupe white, white black, white gold, and white silver.